We’re in town visiting our parents for the holidays and so my mom asked me what I wanted for dinner. I told her my favorite childhood meal: spaghetti with meat sauce with a side of raw cucumbers and raw green peppers with peanut butter. But that’s what the birthday girl wants! HA! Okay, in serious news. I have something to share and I debated posting about it. But here goes. I have postpartum depression. I’m not ready to share my story, as I’ve yet to sit down and write it any way, but I wanted to let you know. This past week was the hardest and scariest time of my entire life. I have immediately gotten help from my doctors and am on medication. I am doing much better. There’s still a long road ahead, but I am strong and will get through it. My husband and daughter are my rocks. At first I was ashamed, but now I just want to bring awareness to other moms. Postpartum depression is serious and it needs to be taken care of immediately. I’m thankful I am getting the help I need. Please keep my family and me in your prayers. This is something that will take some time to heal. I will share my story soon–I feel it’s extremely important. Until them, we’re super busy showing off our adorable little love, decorating for Christmas, and visiting with friends and family. I'm sorry for your struggle, but I'm glad you didn't delay in getting help. Happy Birthday! and I hope things get better for you as soon as possible. hope everything is getting better for you! ps and happy 24th birthday!!! 2.) I'm sorry that you're struggling with PPD. 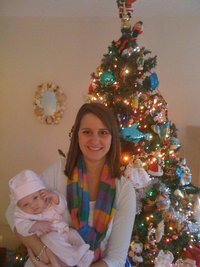 If you read my blogs I'm sure you've noticed that being a new mom was/is no walk in the park for me. Hang in there. I'm going to FB message you my number and if you want to chat, I'm here. Girly, I'm so sorry you're struggling with PPD! I really didn't realize how crazy, dangerous, or even how REAL it truly can be. I have questioned myself if I was going through it since for a few days I was crying unstoppably! I wasn't sad, I just was exhausted and crying was the only thing that was making me feel better. Let's face it…our hormones are all out of whack! I hope you will be able to get over this stepping stone soon. I'm looking forward to reading about your fight 🙂 Praying for you, and I'm here if you need to talk about it 🙂 Seriously! happy happy happy birthday my friend! Happy Birthday Girl! Yay, for birthday dinner requests (minus the peanut butter… JK)! Happy Birthday, girlie! Hope you get better soon! In regards to what you and your family are facing – I believe there is a reason for everything, and I don't think God would have you go through this if He wasn't sure you could overcome it. I am so proud of you for getting help! I hope things start looking up for you! Previous PostPrevious ONE MONTH, BABY!